I woke up last Thursday morning to the words so many of us hoped we would never hear. My mind instantly ran to images of crews scrubbing rocks after the Exxon Valdez as I feared the worst. Then came temporary relief: the spill had been dubbed ‘minor’, and the source was a grain ship, not an oil tanker. But later that day aerial photos of an oil sheen coating Burrard Inlet emerged, as did the first signs that the response to the spill was unacceptably poor. By Friday, the political shift-the-blame-game was in full swing, public health warnings were being posted on our beautiful beaches, and reports of oiled birds were coming in. 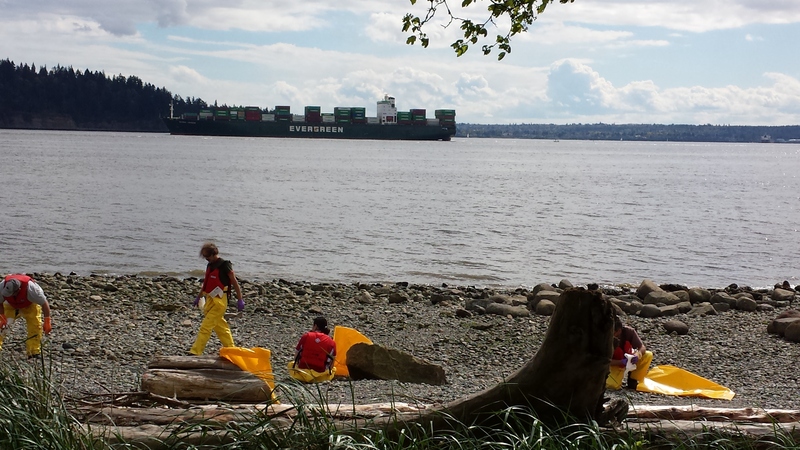 And on Saturday, I found myself rounding a corner of the Stanley Park seawall to come face to face with clean-up crews in hazmat gear that were straight out of those old Exxon Valdez photos. At 5 PM on Thursday April 8, a boater spotted an oil slick in English Bay and called it in. Much later, the source of the spill was confirmed as the Marathassa, a Cyprus flagged grain ship on its maiden voyage, and the substance was identified as bunker C fuel oil. The spill volume is at least 2700 litres. However, that number keeps changing, and there has been no official review since the first 24 hours after the spill, and small releases of oil continued after that point. Approximately 6km of shoreline has been affected so far, include English Bay, Stanley Park (Siwash Rock, Second Beach), North Shore Beaches, Crab Beach and New Brighton beach. Signs were posted at many of these beaches warning the public to stay away from the shoreline to prevent contamination with the toxic fuel. Officials warn that we will continue to have oil washing up on our shorelines from this spill. 20-30 birds have been impacted so far, mostly ducks. The potential longer term impacts on marine ecosystems are as yet unknown, although ecologists have many concerns including the risk to forage fish, which are essential to sustaining life in the Georgia Strait. Fisheries and Oceans Canada has closed Burrard Inlet to all recreational fishing for shellfish and groundfish. Like many of you, I find myself struggling to imagine how this could have happened here, in our greenest city on earth, and in calm spring weather. We’ve been told over and over that we have ‘world class’ spill response in place, and last week the truth came out (despite the federal government’s transparent PR campaign to paint the spill response as effective and timely) : we’re not ready – not even for a comparatively small spill. This incident illustrates what GSA has been telling decision-makers for years: communities need stronger spill response to deal with the threat of oil spills we already face, and we need to minimize future risks by saying no to projects like Kinder Morgan’s pipeline expansion that would dramatically increase tanker traffic in our waters. Despite the spill taking place in the most well-resourced urban area on our coast, the oil slick spread for 6 hours before booms were in place. If this accident had happened in a more remote part of the Georgia Strait, how long would it take for response crews to arrive? How would local authorities cope in the meantime? Right now, GSA is working with a team of experts to assess the adequacy of local government spill response capability, identify additional training and resources that could be put in place to help municipalities be better prepared, and have a stronger voice in planning for and responding to a spill. We saw last week how the community’s role in the response to a spill was hand-cuffed by the 12-hour delay in notifying the City of Vancouver of the incident. We will be presenting this report to the National Energy Board’s review of Kinder Morgan’s application to expand its Trans Mountain pipeline, where we have intervenor status. We will also be taking these lessons learned to communities around the region, to get this critical information into the hands of local governments and the people they serve so they can stand up for the health of their communities. Stay tuned for the report launch in May! 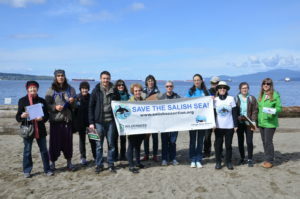 Last Saturday, I spent the day in English Bay with colleagues and volunteers, bearing witness to the spill and its aftermath, and gathering petition signatures asking Premier Clark to take back the province’s power to say ‘no’ to risky projects like Kinder Morgan. It was inspiring to stand together with so many people who simply turned up, wanting to help in some way, and work together to ensure that this can never happen again. Press your community to be prepared. In three weeks, Lower Mainland municipalities will vote on a motion calling for more resources and a stronger voice for communities in preparing for and responding to an oil spill. If you live in the Lower Mainland, please email your Mayor and Councillors and ask them to vote YES. If you live outside the region, why not contact your municipality and ask them what they’re doing to prepare for a spill? Sign our pledge to stop new oil, LNG and coal projects that put the Salish Sea and our climate at risk. And please make a donation to GSA to ensure that we can continue advocating for stronger spill response, and raising your voices in opposition to the unacceptable and exponential risks posed by Kinder Morgan’s pipeline proposal. Vancouver had a wake-up call last week – let’s make sure this can never happen again. My question is in regards to what actual legal rights do we have to voice our concern. The way Mr. O and H have painted things we are now radical terrorists if we stand up for the environment. A good and fair question in the current climate! In my view, in a democratic society, we should all have the right to take action on behalf of causes and issues that matter to us in a wide range of ways, such as those I’ve suggested in my blog (eg. getting informed, signing petitions, talking to your elected representatives) and in other ways (eg. organizing public meetings, attending rallies). The fact that environmentalists worry about getting involved in these basic forms of organizing is a sad state of affairs indeed, and I would encourage you not to be silenced. I’m not a lawyer though, and if you’re looking for specific legal guidance I’d suggest getting in touch with the good folks at West Coast Environmental Law, or other public interest legal groups. Thanks for reading, and keep in touch!